This official Gemini developer's site gives Gemini users additional information to make best use of their telescope control system. Please contact the mount manufacturers or one of their dealers if you want to order the Gemini hardware for your mount. Check this site or contact me if you already have the Gemini and want to upgrade the software to a higher level, if you want to propose new features to be added, or if you experience problems. The Gemini System comes with the German Equatorial Mounts GM-8, G11, Titan and HGM-200 produced by Scott Losmandy. The Gemini is a sophisticated computer controlled servo system with lots of valuable features. Based on 3 microprocessors (one per axis and a main CPU), it is self-contained and fully functional without the need for PC control in the field. To allow for an ongoing development, Gemini software is build and supplied in several levels of functionality. The Gemini system is currently sold (with a mount or as a retrofit) with Level 3 software. Within each level, the software is maintained and changes are indicated by a version number. Levels 1 and 2 are no longer supported, an upgrade to Level 4 is recommended. Correct rounding for southern hemisphere SAO stars declination seconds. TVC speed reduced to 16x sidereal. Change in reply to :MS# command in case the Gemini rejects a slew because the target object is below the horizon. Menu point Setup->Set Timer renamed to Setup->Set Date/UTC. Extended Serial Command Set (see link below). New Synchronize command under the Alignment menu point allows for adjusting the coordinates to an object without affecting the modelling parameters. Quick Menu selection: Pressing the Menu button for more than a second scrolls a choice of Centering Speeds and Visual/Photo Mode through the display. Releasing the button selects what is just displayed. A slew operation from the PC can be started into an ongoing slew. More ruggedized Startup Mode selection procedure. Automated restart by a watchdog timer in case of software failures without loosing alignment and modelling data, giving debug information. Setup->Reset Defaults allows for selection between Losmandy or Mountain Instruments default values. Gemini starts up in the serial command precision mode that was active at shutdown. All Level 1, Version 2.1 features. Additional Native Serial Command Set to allow extended Remote Control and access to the internal parameters (setup values, telescope modelling, ...). Downloadable 4000+ object User Catalog. All significant actions are logged into an Observing Log that can be uploaded to a PC. All Level 2, Version 1.2 features. Sync'ing and "Image Link" using TheSky now possible without a prior slew. UTC Date/Time, Mount Type, Longitude, Latitude can be set directly at Cold Start. Actual UTC Date/Time, Mount Type, Longitude, Latitude values are displayed after startup. MS Windows® Gemini Control Center, now fully supporting Level 1, 2 and 3 features, and providing additional computer-controlled functionality. Beta version for Titan mounts with 50:1 spur gears (Titan50). Bugfix for wrong direction correction by PAC (Polar Axis Correction) at the southern hemisphere. PAC corrected for the Southern Hemisphere. GPS receivers probed at 4800 and 9600 bit/s. Mount type defaults to Titan. Slewing speeds default to 800x. Bugfix for SRAM parameter initialization after a CMOS Reset (f.i. after a battery swap). Outside the Safety Limits autoguider corrections are ignored, tracking is not restarted. Completely redesigned software, supporting custom mounts and remote hand controller emulation. Too slow guiding speed in DEC after changing the guiding rate using command >150 corrected. Movements at Guiding Speed are also supported in Terrestrial Mode. Test for a defective autoguider input chip. Symptom: Gemini freezes after GPS readout. V1.04 checks this condition, a warning is displayed and operation is continued even if the chip is defective. Test for a defective serial port driver chip. A warning is displayed. PEC counter is restored correctly at a Warm Restart. Added some serial line commands for moving the axes by certain mounts of steps (motor encoder ticks). Added a serial line command to read out the motor axes encoders. Owners of a Losmandy Gemini System are entitled to upgrade to the current software. This can be done by replacing Gemini's socketed eprom chip. The new software is available for free download. You need an 512kx8 EPROM in the DIP32 package, up to 120ns access time, 150ns usually works, too. Examples are STS M27C4001, National NM27C040 or Fairchild FM27C040. Please use the eraseable kind with the little window allowing for erasing the content with special UV light, not the OTP (one time programmable). The software is available as an image in Intel HEX record format or in binary form. Please be sure to select the the correct format programming device. Often computer and electronics shops offer to burn images into EPROMs. Don't forget to cover the UV window after erasing and before burning the new image into the EPROM. www.epromo.com Stephan Suys, Ottawa, Canada. www.chromosphere.co.uk Graeme Coates, Abingdon, UK. compressed Intel .hex and .bin images archive (962 kByte). You may want to use the "Save Link Target As" feature of your browser. compressed Intel .hex and .bin images archive (963 kByte). Here's a description how to locate and replace the EPROM . Level 3, Version 1.1 manual . Level 4, Version 1.0 manual . Level 1, up to Version 1.2. Level 1, from Version 2.0 up. If you want to connect a cute little GPS receiver to set your mount's date, time and location automatically a startup, check for StarGPS GPS receivers (the link opens a new browser window)! A star chart with Gemini's bright and alignment stars can be found at duchekconsult.com. You don't like to work through the menus of the Gemini? You'd like to save the settings into a file and download them if necessary? Save the well tested modelling parameters for your permanently mounted telescope? Or script control your telescope? Level 3 and 4 software together with the Gemini Control Center contributed by my son Daniel puts you in full control at the keyboard of your PC. 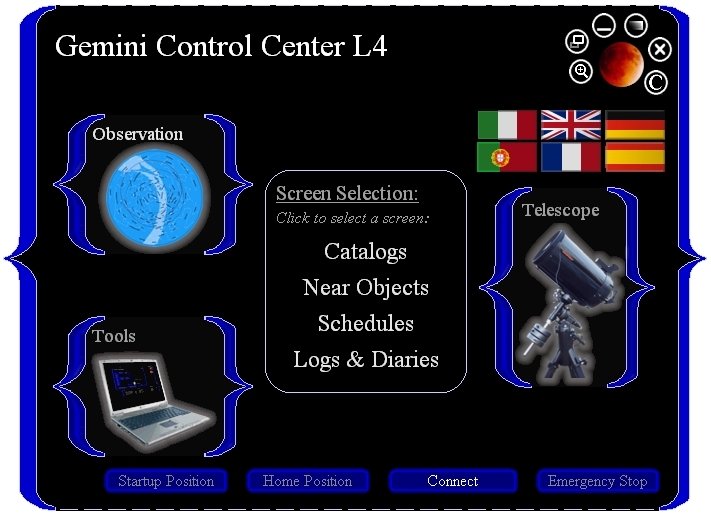 Click here for a detailed overview of the capabilities of the Gemini Control Center. For download and installation, please follow the instructions on this page ! Mike Rudolph and Daniel Görlich have written a comprehensive manual for the GCC (1 MByte .pdf file). PEMPro now fully supports Gemini Level 4 Firmware. This allows for dramatic correction and refinement of PE for all Gemini equipped mounts: PEMPro provides direct upload and download of PEC curves to Gemini firmware and beta testers have reported an average of 80% reduction in Periodic Error using the new L4 firmware and PEMPro 1.6. For technical information regarding specific Gemini L4 support please see PEMPro technical support. For more information about purchasing or upgrading to PEMPro Version 1.6, please visit: www.ccdware.com. 110 Messier objects are stored in the database. Credits for compiling this data to Wolfgang Steinicke! For a list of the objects, please visit the pages of Wolfgang Steinicke at the site of the NGC/IC project (the link opens a new browser window). A list sorted by constellation including additional information was contributed by Dave Sandage. Thanks, Dave! 8 Planets, Sun and Moon. 1125 Bright Nebulae from Lynds' Catalog of Bright Nebulae. ... and 4000+ User Catalogues objects down- and uploadable via the serial interface. You can prepare your observations by building user catalogues using your computer and and downloading them into the Gemini using the Gemini Control Center. Well prepared observing, together with the automatic logging of your actions, can be much more effective. It is not possible to upload Gemini's databases to your PC. If you want to compile your specific observing lists for the night using the objects from the Gemini's databases, here they are in the Gemini User Catalogue (.guc) file format. You can download them, copy and paste your targets using your favorite editor, building up your specific programs for the night. The Losmandy_users group targets all questions regarding Scott Losmandy's mounts, with or without the Gemini GoTo system. The archives are full of valueable information. and of course to Scott Losmandy for putting the system into this nice housing, all the mechanics, the manufacturing, the marketing and much more! Klick here to get the UTC data/time in Gemini style.